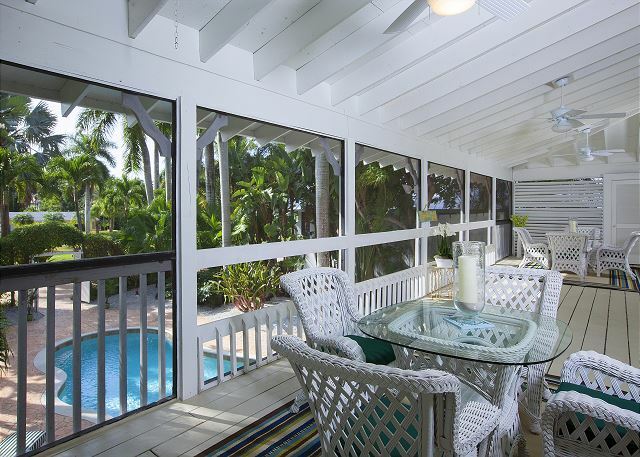 Canary Cove Cottage is a private, tropical oasis nestled in the perfect location, right in the heart of Olde Naples! 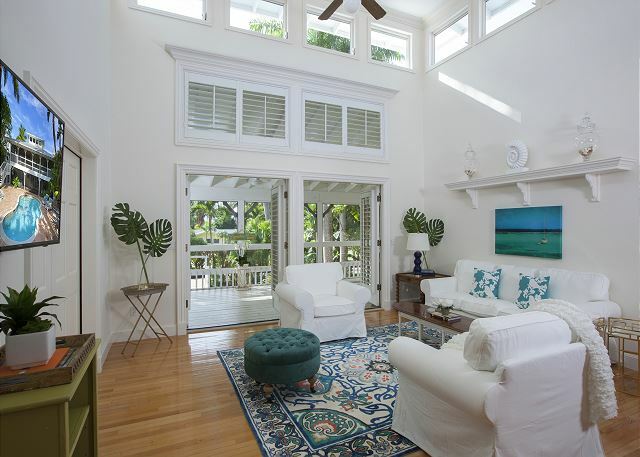 The classic Key West style home invites relaxed Florida living with all the modern amenities you could hope for in a beach house. Walk 2 blocks west to Third Street South, home of the renowned Naples farmer’s market, Tommy Bahama’s and many more elegant shops and eateries. Three more blocks west you’ll find yourself at the pristine white sand beach and historic Naples Pier - a community landmark! Walk 3 blocks east from the house to Crayton Cove to catch your boat captain at Naples City Docks for a day of fishing or explore the wonderful shops and restaurants nearby. The home itself has a cozy and laid back feel offering plenty of space for family and friends to gather and relax. The main living areas and three bedrooms are located on the second level, accessible from the ground floor garage by both an interior set of stairs and an elevator. The bedrooms all have super comfortable beds made up with high end linens for a dreamy night of sleep! 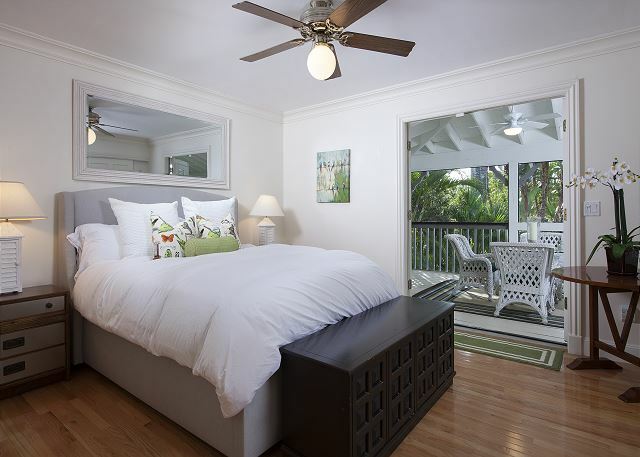 Two of the bedrooms have french doors out to the spacious screened lanai, perfect for enjoying the balmy ocean breezes and swaying palms over breakfast or cocktails. Bring on the dinner parties! 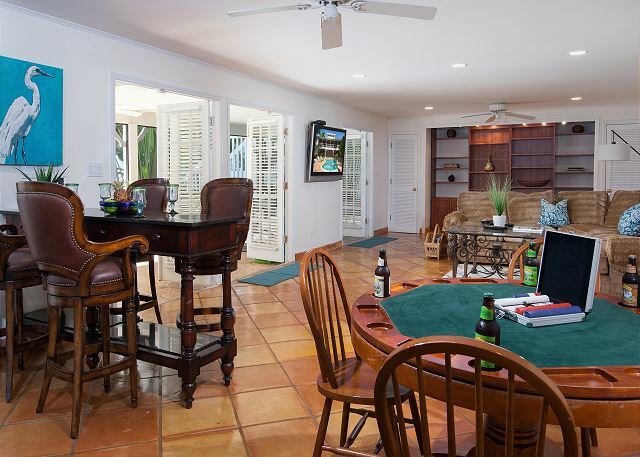 There is dining space for 8 both on the lanai and at the inside dining table. The open kitchen is fully equipped with Thermidor appliances, beautiful glassware and plenty of cooking and serving supplies. A Weber gas grill is accessible through french doors, set on an enclosed patio off the kitchen and dining area. When it is time for fun, Canary Cove will not disappoint! A large bonus room on the ground floor has another large TV, comfy sectional sofa, poker/game table, granite bar top, refrigerator, full bathroom and a murphy bed to sleep two more people. A ping pong table is stored in the garage and can be setup for you on request. French doors lead out to another screened lanai and the lushly landscaped outdoor pool area beyond. Southern exposure delivers sun all afternoon and the free form saltwater pool has a gas heater, inviting year round swimming. Please note, while all other household utilities are included in your rental price, the cost of propane for the pool heater will be charged to you based on actual usage. This has become the most fair way to account for varied usage levels based on individual water temperature preferences! If you’re looking for the ultimate Olde Naples experience and total relaxation in paradise, Canary Cove is for you! 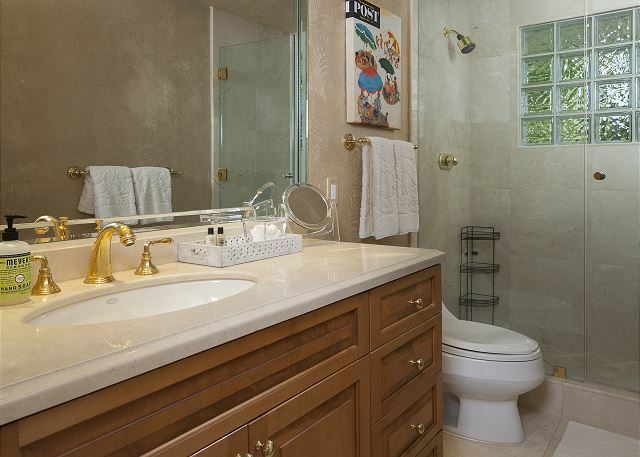 *Please note that the master bathroom has only a Jacuzzi tub - no shower! There are showers in both other bathrooms. This was my family's second year in a row renting the Canary Cove Cottage. 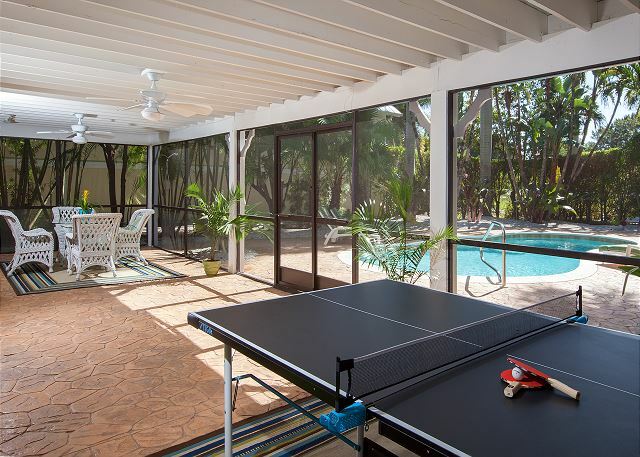 This is an amazing property that has everything you need to have a fun stay in Naples. It would take too long to list all the things I like about this property but for me the screened in patio overlooking the pool is fantastic for relaxing, and eating your meals. The pool is perfect and the location to 3rd ave action cannot be beat. If your considering this property, rent with confidence. First class house and first class agency running the show.. Thank you, Greg! Hope to have the opportunity to host you again in the future! Everything was perfect! Location is to die for! We walked and rode the bikes everywhere! Loved every minute of our holiday. The house is super comfortable and so close to the beach and and 3rd Street restaurants and shops. We loved our stay there! Thank you, Marion! We are so glad you took advantage of the ideal location and were able to access downtown Naples easily via bikes and walking! We hope to have the chance to host you when you are in the area again! Thank you, Jay! We're glad you had a wonderful vacation in Naples! We have definitely discussed installing a shower in the master bathroom so hopefully next time you visit, there will be one! We would love the opportunity to host you again in the future. We thoroughly enjoyed our stay at Canary Cove. The location was fantastic, just blocks from some of our favorite restaurants and an easy walk to the beach. Wonderful outdoor space at the house. Despite the weather being somewhat uncooperative we really enjoyed our stay. Would definitely stay here again! Thank you, Gregory! You can't beat the location when staying at Canary Cove Cottage. We hope to have the chance to host you next time you visit Southwest Florida! We had the perfect house for the 8 of us in the perfect location. Walk to beach and town! The home was beautiful and well taken care of. Would definitley go back and highly recommend. Thank you, Donna! 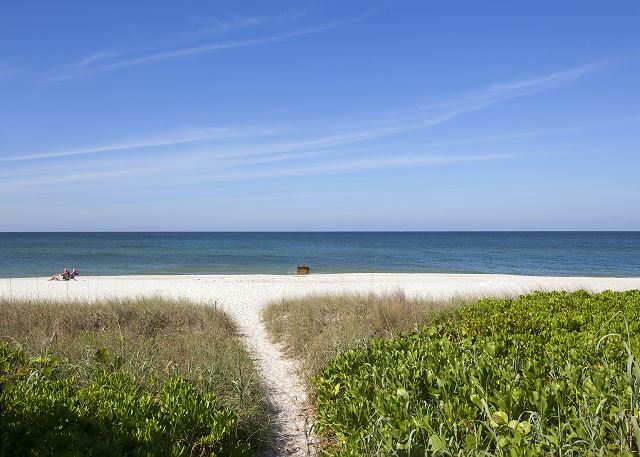 The location of Canary Cove Cottage is perfect for exploring all of downtown Naples and walking to the beach! We would love the opportunity to host you again in the future! See you next time! This home suited my family of six (two couples, two singles) very well. Beds and furnishings were very comfortable. Pool was great fun, wish we could have used the bikes! Thank you, Timothy! You were more than welcome to use the bikes, they are there for guests! We're glad you enjoyed the furnishings and the pool area. It's a wonderful home for big families! See you next time! A very nice comfortable and homely property ideally situated in Naples . Close to the beach and to Old Naples beautiful commercial area with fine shopping and attractive bistro’s and restaurants . The house is ideal for a family comfortably lodging 6 to 8 . A very nice pool ideal for children and nice social area on upstairs and downstairs terraces . Outstanding support from agency , helpful setting up the event and very cooperative throughout. . Overall an outstanding rental experience . Thank you so much, Michael! You were wonderful to host and we would love to be able to accommodate you next time you are in Southwest Florida! Sounds like you explored everything Naples has to offer! There is always a bit of uncertainty when renting a house for the first time but I have to say Casey and her team are true professionals. Casey made us feel comfortable right from the start with the easy booking process to greeting us and showing us the property when we arrived in Naples. The property is as beautiful as the pictures show if not more impressive. Renting the Canary Cove Cottage really made for a wonderful trip. The location is fantastic, just a few minutes walk to the Beach/Pier and 3rd ave. Thank you, Rich! We are always here to help and make sure our guests have a fantastic vacation! See you next time! A great time. Loved the lay out of the place and the location. Pool wonderful. And really enjoyed the screened porches. Thank you, Mary! We're happy you had a great vacation in Naples! See you next time! Close proximity to shops, restaurants and beaches. Excellent stay at this villa which is situated just a short walk from the restaurants and shops on 3rd Street South. The villa was lovely inside and out and the children loved the pool and ping pong table outside. I certainly would consider staying again at this villa. Great location within walking distance of the beach, third street shops and dining as well as Naples Bay. Five star service from Holiday Life management company.